People have various paths to changing to an all-real food diet. Sometimes it’s for health, sometimes it’s a more global reason, and many times it’s because your body or your child’s body seems to be off and you’re desperately trying to figure out what’s going on with it. Lately, many people have been asking me our story. When my oldest son was 4 years old, he started kindergarten. We started having issues with the teacher. When he was in preschool, I knew he was different, and he started stuttering over words, but it was sporadic, and my mommy intuition told me something was different and off, it wasn’t just a speech issue. He had days were he was insanely impulsive and energetic, and his eyes seemed glazed over. Other days it was like my child was “back”. I could see him clearly. I started feeling like there was a food connection. I don’t know why, just instinctively I started asking him what he ate for lunch on days he was “glazed over”. It wasn’t long before the teachers were suggesting “ADHD”, and I was researching for hours online. We started noticing odd vocalizations, a coughing noise, tongue clicking, a squeak. I discovered the terms “spirited” and “sensory processing disorder” as I started listing things that set him off (odd textures, windy days, standing or sitting too close to someone, bright light, loud noises). Finally, because we had an obstinate kinder teacher who refused to work with us or him (the kid started kindergarten already reading and she expected him to quietly sit and color princess coloring sheets, can we at the very least get some super hero ones? No wonder he’s acting out…), we decided to take him to a pediatrician. I knew I would not put him on meds and searched for a pediatrician who I felt would work with us. We were insanely blessed to find an Integrative Medicine Pediatrician who specialized in treating kids with “ADHD” who didn’t want to be medicated. The very first thing he did was put him on a fish oil supplement, and start him on a multiple food elimination diet, to see if the behaviors were food-related. Then he referred us to a neurologist for a possible Tourette’s diagnosis. To know if your body is allergic to a food, there are blood tests that can be done, or prick tests. These tests are not extremely reliable, they produce both false negatives and false positives. If the reaction to a food is behavior based, the only sure-fire way to determine if it’s food related is to systematically remove foods from your diet and see if the symptoms subside. This is very time consuming if you take one food out at a time. Also, if your body reacts to multiple foods, you’re wasting your time. The best way to determine what foods you are reacting to, is to remove most possible foods at once, the reintroduce them. This is called a multiple food elimination diet. The one we used, and have shared with countless others suffering from behavioral issues, spectrum disorders, eczema, rashes, chronic stomach trouble, chronic allergies or colds, IBS, GERD and other issues, is listed below. Essentially, you remove all major allergen foods for 2-4 weeks, until the symptoms subside. Within two weeks, our son emerged, and stayed with us. No more glazed over eyes, no more angry outbursts, and a dramatic reduction in impulsivity and energy level. He still had tics and still has sensory issues, and did receive diagnoses for both Tourette’s Syndrome and Sensory Processing Disorder. But, once we separated his food-related behavior from the other two, we could begin to give him the tools he needed to overcome and thrive with his TS and SPD. We discovered through the diet that he was especially sensitive to artificials, especially MSG and Sodium Nitrate/Nitrite. In addition, he was allergic to soy. As long as we kept soy and additives out of his diet, his “ADHD” behavior was gone. Many doctors re now suggesting kids with “ADHD” or on the autism spectrum eat a gluten- and dairy-free diet. Personally, I feel that many people see success with this either because the child is, indeed, reacting to either gluten, wheat, or dairy, or because with that diet, most processed foods are eliminated, which eliminates a host of other possible allergen foods. To me, it makes more sense to TEST your child and figure out what they personally react to. Since doing the diet, six years ago, I’ve spent a good portion of my time cooking our meals from scratch. After strictly eliminating soy from my son’s diet for several years, he now can eat most everything, except for soy sauce and straight soybeans. We still attempt to eliminate additives and artificials and eat as clean as possible, but he has more flexibility in his eating, which is great for a social pre-teenager. Our pediatrician moved to California a little while after we started our journey, and I just discovered that he published a book to help parents of kids with “ADHD”. We will forever be grateful to him for his help on putting us on our path to better health, and our son’s path to success. This diet will work with absolutely any condition you think may be food related. Within a few weeks, you’ll know for sure if it is (well, if it’s any of the foods you are removing). It can be difficult, especially for kids. There can be absolutely NO cheating, not even a little bit, for it to work. We find it’s easiest to do when the kids are out of school, and try to work it around holidays. Eliminate the following foods completely from your diet for up to 4 weeks, or until the symptoms completely subside. If the symptoms don’t go away, they are not due to a food allergy (at least for these foods, which are all of the common allergens). If they do go away, and you have been on the diet for at least 14 days, bring one food back in to your diet. If the symptoms are still gone after 5 days of eating the new food, it is safe to bring in another food. Do this for each food item. If the symptoms return after introducing an item, that may be the culprit. Eliminate that item again until the symptoms go away again. 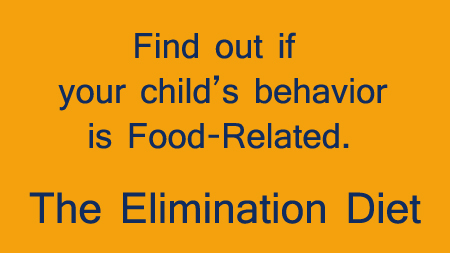 Continue to bring in the other foods on the list one by one to see if any other foods may also be causing the problem. Eat as “clean” as possible. Eat organic when possible. Check ALL labels. If you can’t pronounce it, don’t eat it. Eat rice pasta, rice bread, Boars Head brand deli turkey and chicken, a lot of fruit and veggies, lean natural meat.